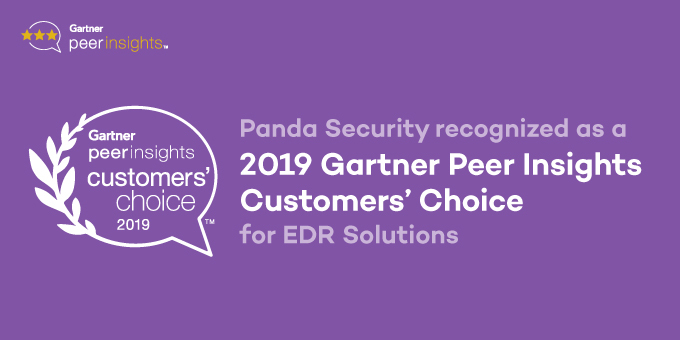 Panda Security is recognized as a 2019 Gartner Peer Insights Customers’ Choice for EDR Solutions. The Gartner Peer Insights Customers’ Choice distinction is based on feedback and ratings from end-user professionals who have experience purchasing, implementing and/or using the product or service. Panda Security, a leading European multinational in advanced cybersecurity solutions and services, is delighted to announce that we have been named a January 2019 Gartner Peer Insights Customers’ Choice for Endpoint Detection and Response Solutions, thanks to our Panda Adaptive Defense. Being named a Customers’ Choice means that Panda Adaptive Defense is recognized on the powerful online platform, Gartner Peer Insights, on which reviews are written and read by IT professionals and technology decision makers within corporations. Contain the incident at the endpoint. The concept of the distinctive security model offered by Panda Adaptive Defense is based on monitoring, classifying, and categorizing absolutely every running process (100%) on all endpoints on the corporate network. If anyone tries to perform any action, the Panda experts are aware of it immediately, and verify where it originated, how the attempt was made, and what its intentions were. As well as this, the response and remediation capabilities recognized by Gartner allow us to react even before any effects can occur. And the fact is that Panda Adaptive Defense 360 is not a product; it is a cybersecurity suite that merges Endpoint Protection and Endpoint Detection and Response (EDR) solutions with 100% Attestation, and Threat Hunting and Investigation services, all provided with a single lightweight agent. The combination of these solutions and services provides a highly detailed visibility of all endpoint activity, an absolute control of all running processes, and the reduction of the attack surface. Do you want to know how our cybersecurity solution works? Gartner Peer Insights transforms the way enterprise software is bought and sold by creating another source of trusted information in the software buying process. Gartner’s review platform is a place for all IT buyers to find advice they can trust from fellow IT professionals. Gartner Peer Insights includes more than 40,000 verified reviews in more than 190 markets. Reviews have been edited to account for errors and readability. Gartner Peer Insights Customers’ Choice constitute the subjective opinions of individual end-user reviews, ratings, and data applied against a documented methodology; they neither represent the views of, nor constitute an endorsement by, Gartner or its affiliates. Reviews have been edited to account for errors and readability. What can we expect from the mobile industry in 2019? I Use Panda Security Antivirus From A Year And Its Amazing . The Security Is Awesome. I like it .